Sound engineer and musician Björgvin Benediktsson teaches you How to Record Great Music with whatever equipment you got! Audio engineering and music production are a huge subject, but by breaking down the essential facets of audio engineering and recording into easily consumable chapters, Björgvin gets you up and running by covering everything from buying essential audio equipment to using reverb effectively in your recordings.If you've been thinking about recording music or dabbling in audio engineering, then kick-start the process by grabbing a copy of Björgvin's book and start learning how you can record great music with whatever equipment you've got! Hi I'm Björgvin, and I decided to write How to Record Great Music because I felt like it was time to give back to the audio community. When I was studying sound engineering, and was just starting out in the industry, I was intimidated by all the things I seemed to either need to have or know how to use. I got tired of always looking for tips and practical help online, especially when all I usually ended up with were sites that were more interested in showcasing the newest sample library or synthesizer, rather than actually teaching you how to do certain things or use some of the audio production tools that are out there. I had a ton of questions, and I wished there was a simple and straight-forward book I could refer to - but there wasn't - so I decided to turn things around and change that by writing a book myself. 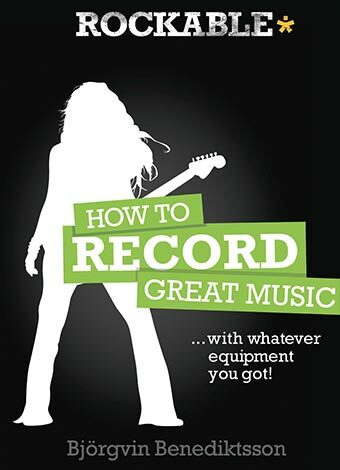 This is the book I wish I had when I was learning the ropes, and I've tried to keep it broad and make it a practical guide to audio recording and engineering. I personally really like quick tips and I feel that practical applications are crucial to remembering how and why to use a specific technique, so I won't be delving into the theoretical specifics of every little thing, but I'll try to give you an overview of the basics and the practical knowledge needed to start in the world of audio engineering and recording music. Recording music is a subjective process and nobody does it exactly the same way. Sound engineers are usually trying to reproduce something that they hear in their head by using the tools they have on hand. However, regardless of the music genre or style, there are always certain things people try to capture in order for their instruments to sound good. In this chapter I take a look at what exactly those things are, and what needs to be considered when trying to identify what makes a good sound. In this chapter I go through the proper steps involved in recording a great song and explore how you go from an idea to its implementation and to the final product. It's always easier to know what you have to do if you have an easy-to-follow, step-by-step guide which takes you from start to finish. Choosing the right type of microphone and the right mic set-up to use in a recording is an important part of the recording process and so in this chapter I look at some of the different types of microphones available and which techniques are best suited for various instruments and recording scenarios. In this chapter I cover the steps you need to take to make sure you have a clear understanding of what you need to accomplish during the recording phase in order to save yourself (and others) a lot of hassle and time in the studio, and to increase your workflow. Many of today's audio engineers and bedroom recordists do most of their work on a computer, and don't really depend on bulky mixing boards any more, but the functionality is the same and so in this chapter I take you through the main features found on a typical channel strip of a mixing desk and explain what they are for. Audio editing is one of those menial tasks that take time, but once you do, you're glad you did it. It's kind of like cleaning your refrigerator, or mowing the lawn. It leaves you with cleaner audio that is easier to work with and takes your recording to a whole new level. In this chapter we look at the clean-up process of what needs to be done after the recording is complete and identify all the things you can do to differentiate your recording from that of an amateurs to that of a professionals.